If you are looking for a new idea to get your family on board with eating less meat or just eating more mindfully, and to save money as a bonus, this Quick Bolognese recipe is a fantastic idea. A little bit Italian sauce, a little bit Canadian poutine, but with the different combination of crunchy “fries” and savory sauce, no cheese is necessary. Quick Bolognese over Polenta Fries. Something different (and delicious of course) to make for your meatless Monday. So, you see those tubes of polenta in the Italian section at the market. You see them and you think …looks yummy, but what should I do with it? …And I am here to tell you to make fries! Golden, cripsy outside, creamy inside, polenta fries. Just about one of the easiest things to make, and they are tasty as hell. 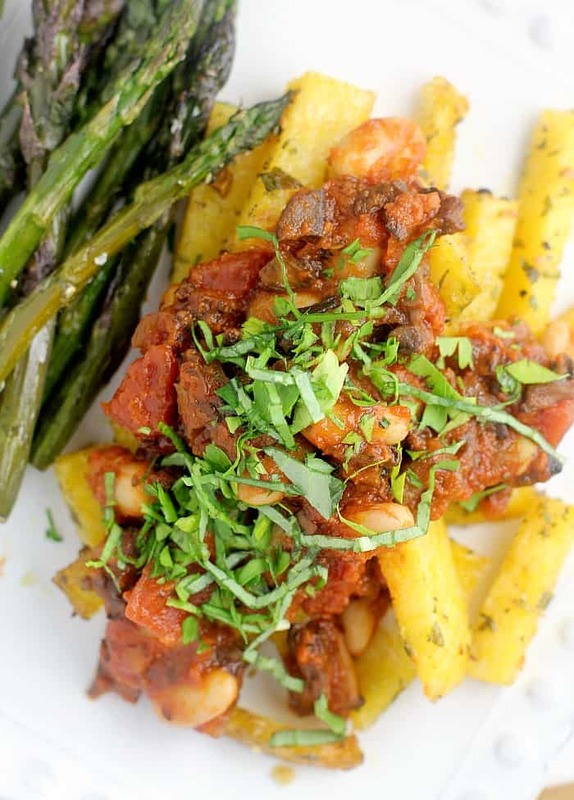 …And then just top with a quick and easy vegetarian spin on bolognese (with a side salad or something), to make your healthy, New-Year-New-You meal complete. This dinner …is just so easy. 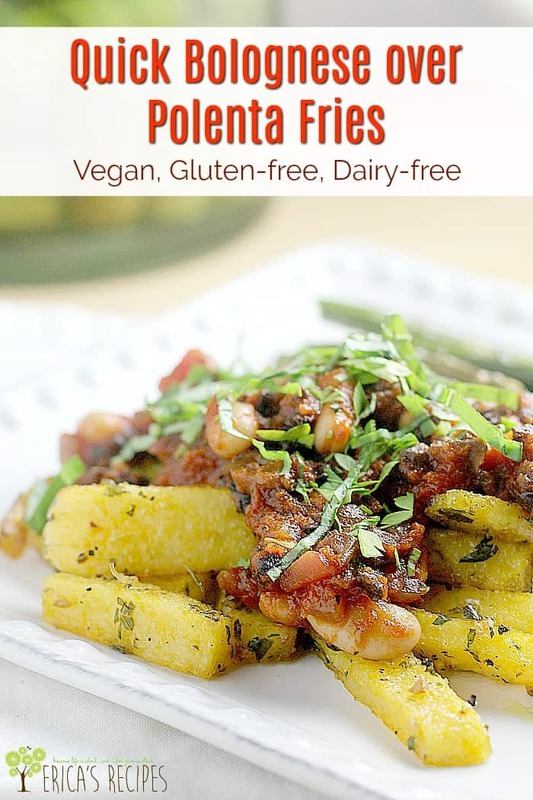 Cut open the tube of polenta, cut into “fries”, toss with some oil and herbs, and bake. Boom. Then while that is happening, make the bolognese. By using mushrooms, we don’t even notice that there’s no meat. By adding red wine, we deepen the flavor and make it suh awesommmme (and cook off all the alcohol, so no worries). And by adding some beans, we add protein and fiber and make this the fullFilling (see what i did there?) meal it was intended to be. So that’s it folks. Kinda random, but really delicious. A new recipe idea, with everything it needs to make all the family happy happy. A little bit Italian sauce, a little bit Canadian poutine, but with the different combination of crunchy "fries" and savory sauce, no cheese is necessary. 1 18 oz tube polenta, cut into 2 x 1/2-inch "fries"
2 cups Marinara or spaghetti sauce a good quality one! Heat the over to 425F. 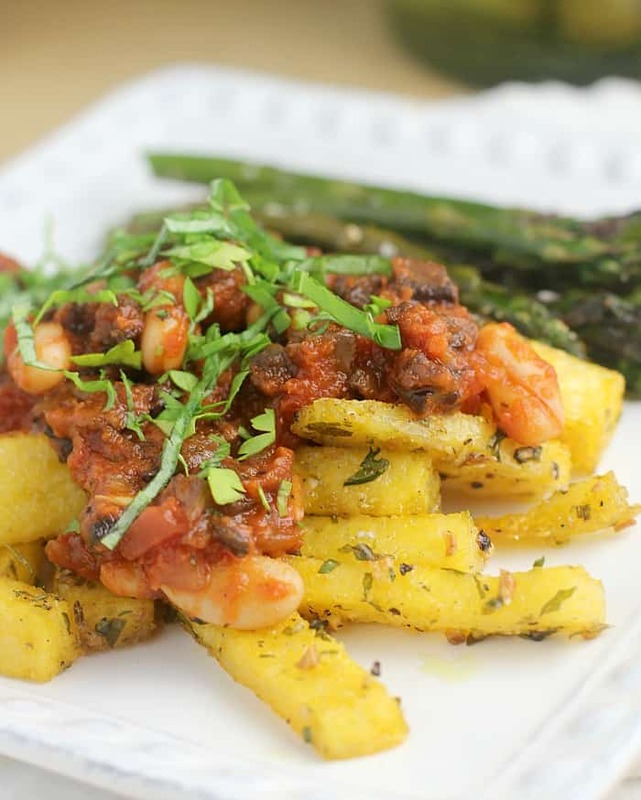 Toss the cut polenta fries in 1 Tbs olive oil, the garlic, and parsley. Season well with salt and pepper. Spread in a single layer on a bake sheet. Bake at 425F for 20-30 minutes until sizzling, golden brown, and lightly crispy. While polenta is cooking, heat a large nonstick skillet on high heat. Add the remaining 1 Tbs oil and mushrooms and cook, tossing regularly, until well browned. Add the onion and cook until onion is translucent and lightly browned. Add the red wine to deglaze the pan, scraping up all the browned bits. Add the carrot, beans, and marinara sauce. Heat through. Season to taste with salt and pepper. 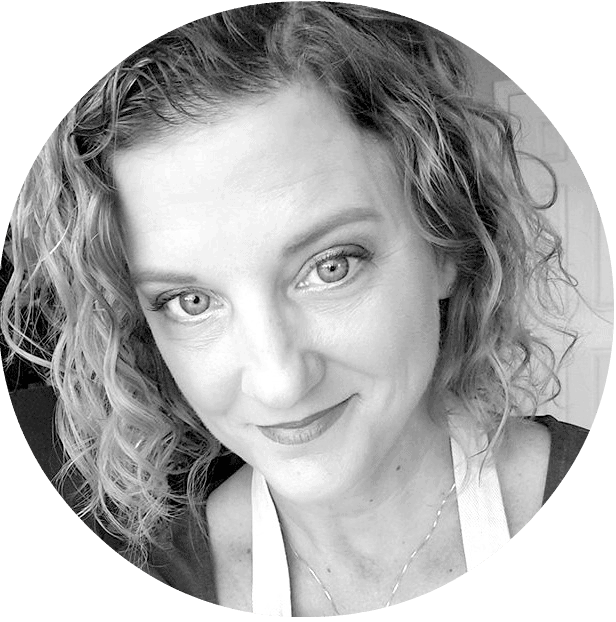 Serve the bolognese over the polenta fries. Drizzle a little olive oil over and top with fresh herbs (to make it pretty!). This looks great. 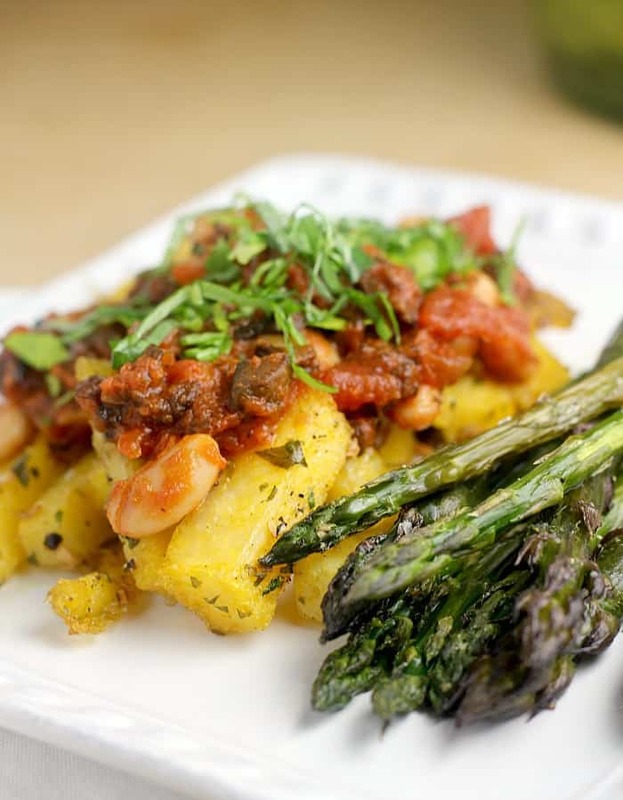 Love the idea of putting a bolognese sauce over polenta instead of regular pasta. I’ll have to give this a try. Thanks for the inspiration! Definitely delicious Erica. 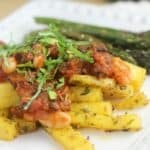 I can’t wait to give this a try, we love polenta as well.